Today, we are going hands-on with an interesting new watch from a brand we first wrote about in 2016. Back then, Swedish brand E.C. Andersson was running a Kickstarter campaign to fund its first model, the military/marine inspired North Sea. As you may recall, the campaign was ultimately successful, and the first collection sold out. Now, the team are back with their second collection, the North Sea II, which looks very similar to the first version but features a number of subtle, yet important, updates. Given the popularity of the original model, keeping the same aesthetic is definitely not a bad thing. 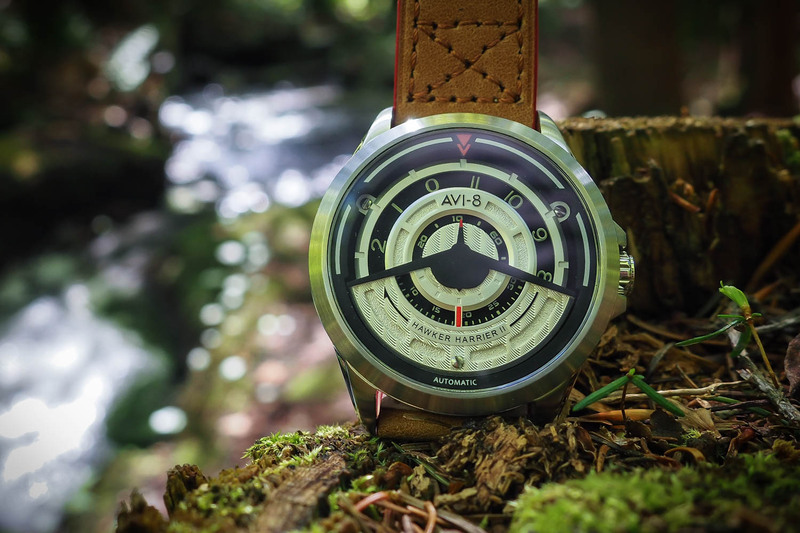 Read on for our detailed review of this comfortable yet robust timekeeper, that’s happily, still also very affordable. Scandinavian design is renowned for its focus on functional simplicity, without compromising on the details and North Sea II certainly lives up this reputation. 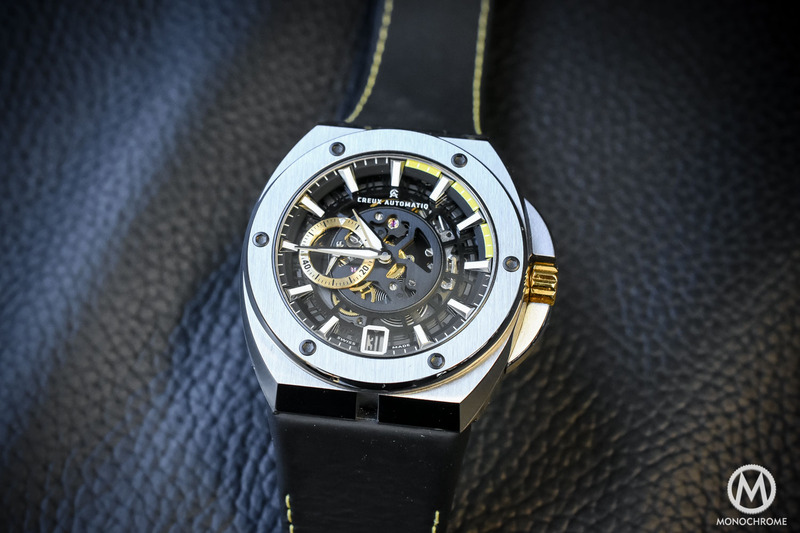 The overall design has a certain rawness to it, giving the watch something of an industrial look and feel. It’s clear this watch has been built to be worn in all situations and E.C. Andersson says as much in its marketing copy: “we want to create watches with high quality, developed to endure all challenges, occasions and environments in your daily life.” Ostensibly, I would say they’ve succeeded. The North Sea II is indeed robust and functional, yet it’s also versatile and looks just as at home on a sailboat as it does in the office. 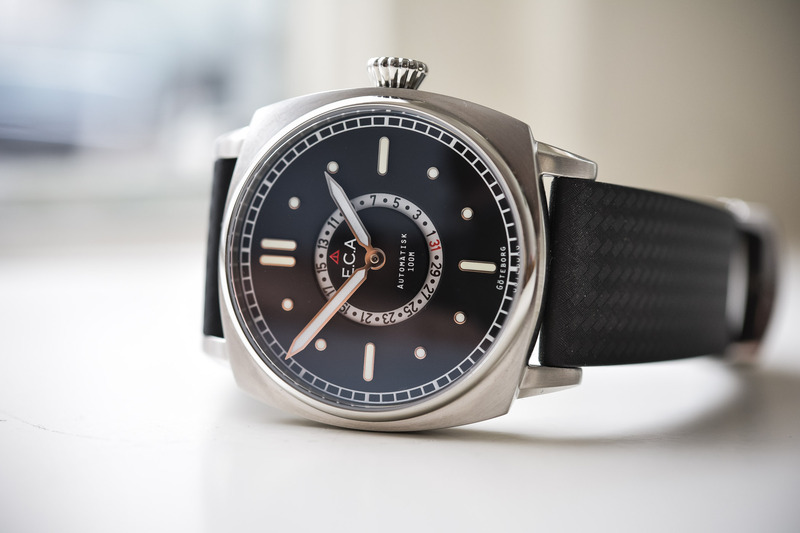 Like the original North Sea, the North Sea II is offered in a nicely-sized, 40mm cushion-shaped, steel case. At 12mm, it is 2mm thicker than the first model, however, this is because E.C. Andersson decided to further stabilize the movement with a new solid metal holder. There are also new dials clamps, all of which required a slightly thicker case. The goal of these changes is to achieve the highest level of shock absorption possible, making the movement more robust and reliable. In line with this increased thickness, the crown has been expanded by 1mm in diameter to better harmonize with the case as well as to house a sturdier screw-down mechanism. The parallels to Panerai are certainly undeniable but I wouldn’t go so far as to call this a homage piece. In fact, I think it’s pretty clear that E.C. Anderson are not trying to emulate the historic Florentine brand, even if they have drawn some inspiration from it. The lugs are short and curved, ensuring a snug fit on the wrist, and the moderate case size means it wears very comfortably. A screw-down, lock-in crown and a solid, sealed case caseback, ensure the case remains water proof to 100m. There’s also a black PVD-coated version, if you want something a little more stealth looking. 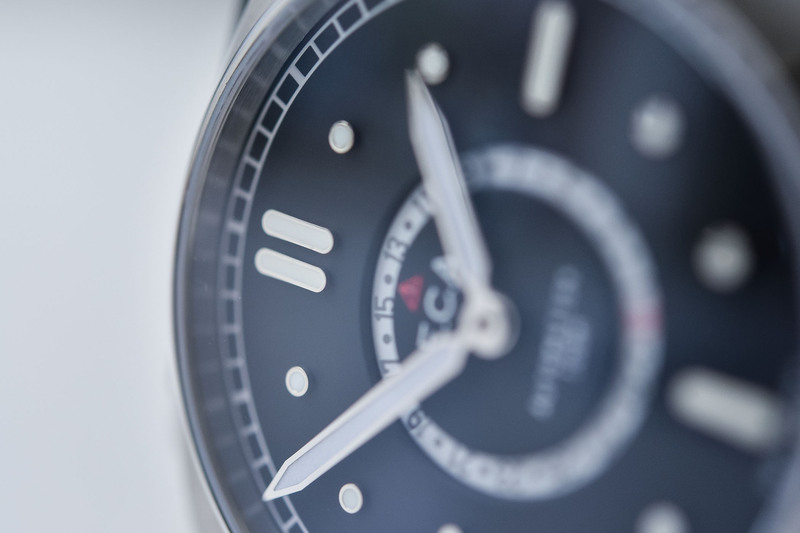 The dial of the North Sea II is relatively simple and yet still surprisingly striking. 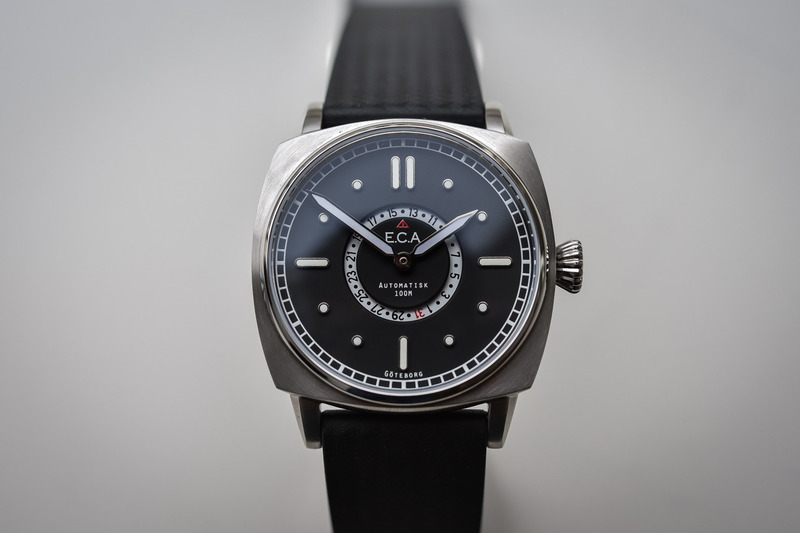 At first glance, it’s in some ways evocative of the dial of the Rolex Sky-Dweller, with the exposed white calendar wheel in the centre contrasting strongly against the matte black dial and a red triangle indicating the current date. Again, I’m not sure if this is an intentional homage, although E.C. 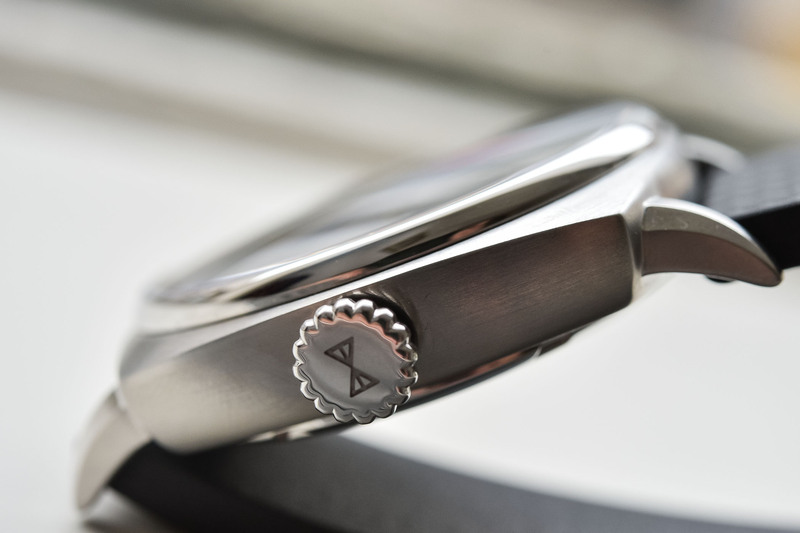 Andersson does mention on its website that the North Sea II is a watch that pays tribute to the heritage of horology. What I can say, however, is that I quite like this design and think it’s a clever way to stand out from the crowd without resorting to cheap gimmicks. Overall, the dial itself is very legible. Hours and minutes are displayed centrally, with large baton markers at 12, 3, 9 and 6 o’clock, and dots at the other hours. All of them, along with the hands, are covered in luminous paint to ensure maximum legibility, even in low-light conditions. 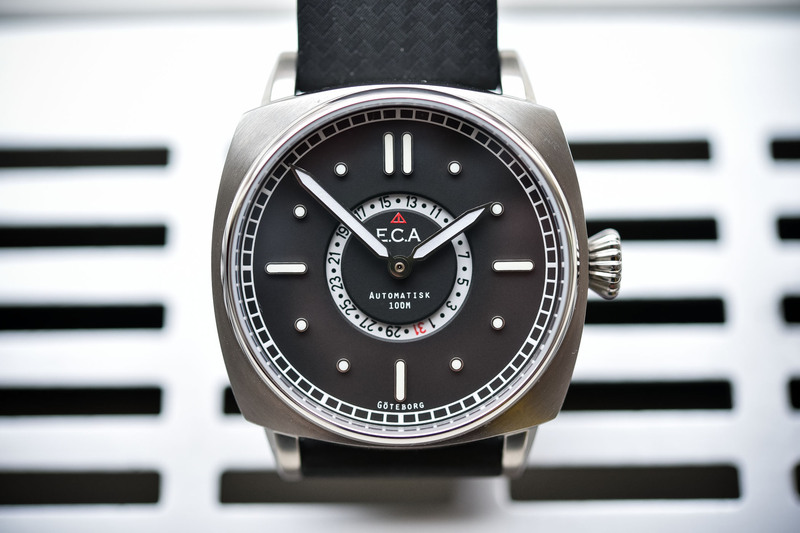 A railway track chapter ring runs around the outside of the dial for the minutes. 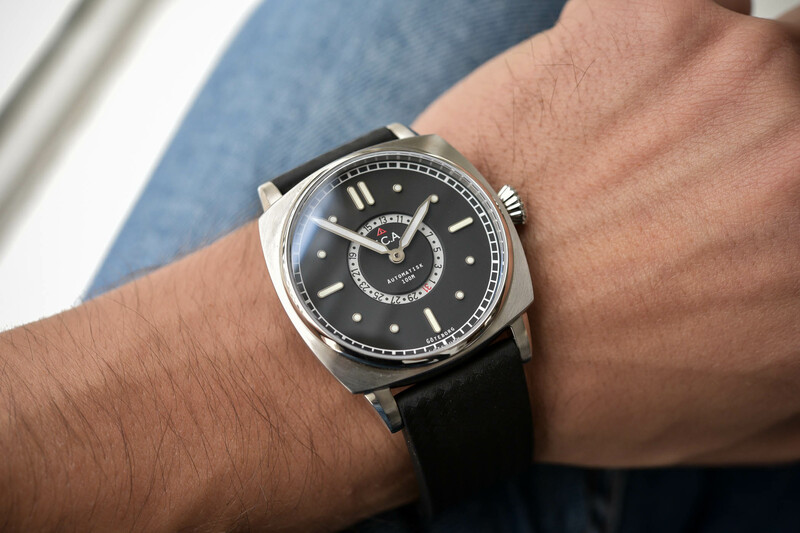 What is missing from the original model is the central seconds indicator, which I think is more in-line with the minimalist design of the dial. 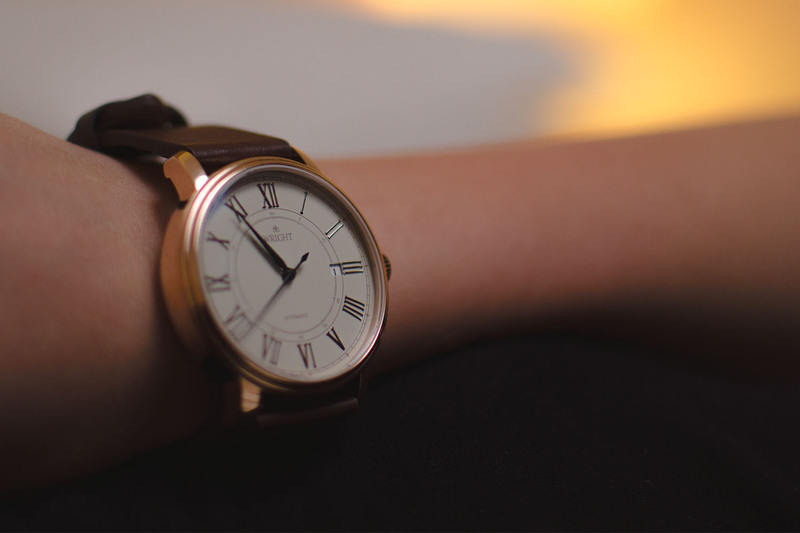 What’s not apparent visually is the fact that the hands have been made from a lighter material than on the first North Sea, and tighter tubes have been used on the central stem to increase tension and improve communication between the hands and the movement in a bid to further increase the accuracy of the watch. Inside the North Sea II is the robust and reliable Seiko Calibre NH05 Automatic, the same as the original North Sea. 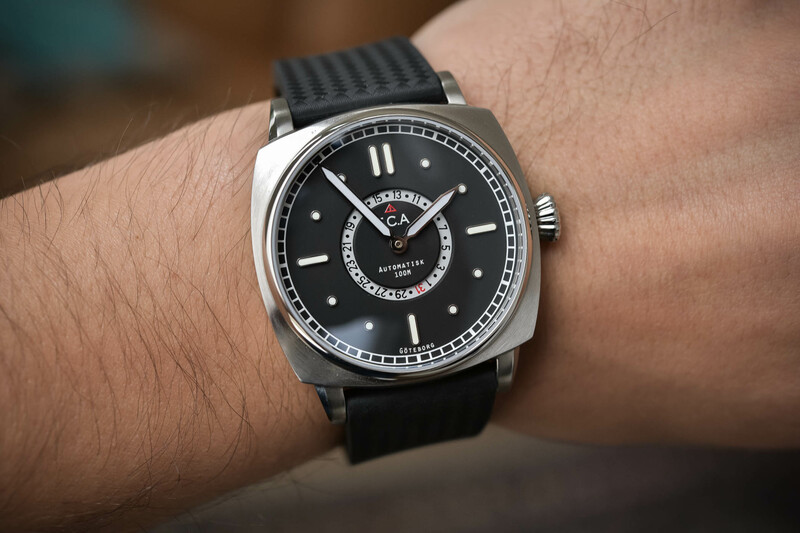 However now, all movements are hand-regulated to achieve an accuracy-level comparable with much higher end brands, a significant improvement according to the brand. As a result of these and the above mentioned improvements to the accuracy and reliability of the movement, E.C. Andersson have increased the warranty on the watch to 3 years. 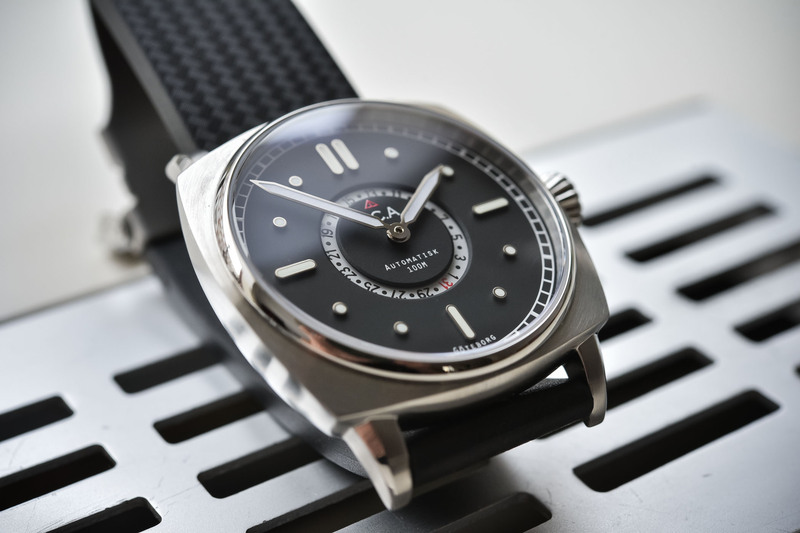 The NH05 offers a power reserve of 50 hours and is extremely reliable, not to mention easy to service, although with careful wear you should only need to do that every decade or so. 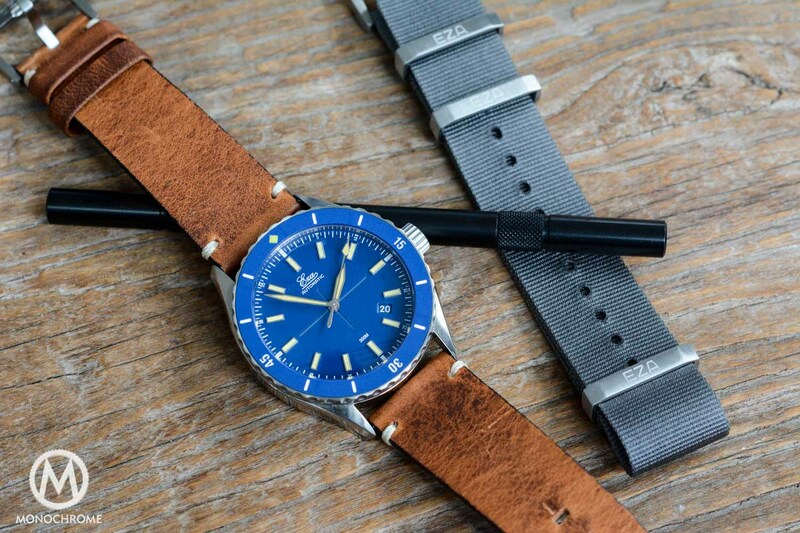 The North Sea II is available on your choice of a range of straps, including NATO, vulcanized Italian rubber and a steel, Milanese-style mesh bracelet. As you can see in the photos, we reviewed the model with the rubber strap and found it to be very comfortable. I’m also quite partial to the NATO strap, which would make the North Sea II a great summer watch, although the mesh strap is tempting too. 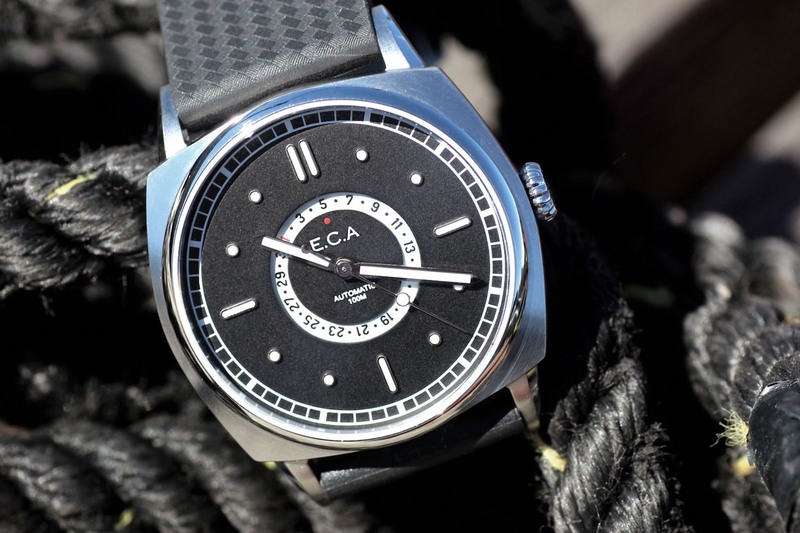 Currently there are three versions of the North Sea II available: North Sea II – Steel Mesh (€580.00), North Sea II – Black Edition (€550.00) and the standard North Sea II we reviewed here (€590.00). Each is available in a limited, individually series of 250 pieces. Overall, the North Sea II is a great watch for the money. Well-sized, comfortable and different enough to stand out from the crowd without being gimmicky. More details on www.ecandersson.com. A shame they got rid of the seconds hand. Thank you for the nice review but it would be very helpful if you included the lug length in your technical information as that is rather important as to how the watch will fit on the wrist. Not clear as to why this important information is almost never included in a review. Thank you. Panerai-clone? Sure a cushion case, but there are no similarities beyond this. Odd that they removed the second hand after “fixing” an engineering issue with the movement, but from a design standpoint, impressive.